Shrimp from Giovanni’s Shrimp Truck! In our rental car we cruised the north shoreline of Oahu seeking out the beautiful ocean views and keeping an eye toward the elusive Giovannis. It is amazing how many shrimp trucks are on the island. Finally we found the truck at a flea market. Set up next to a covered pavilion, we (Keith and I and Debbie) ordered shrimp scampi. My brother-in-law Craig, not a seafood lover opted for a hotdog which actually had the scampi fixings. Wonderful, marvelous, great are the words that come to mind. 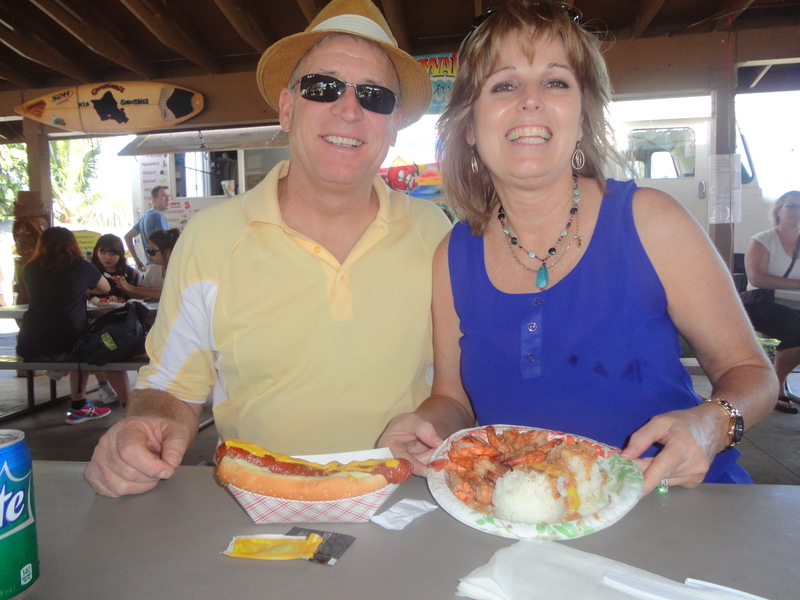 The shrimp truck is easy to locate because since Ed Hernandez from El Paso, Texas left his signature on the truck. Thousands of loyal fans have added their John Hancock as well. We truly didn’t see any room to add our own! After winning several national and international cooking competition wins, their name got out and tourists just like us have been flocking to enjoy a bit of the great white shrimp concoctions offered by Giovannis!